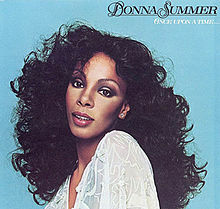 Last night Donna Summer passed away. It's always sad when a singer passes away - especially when it's not Cliff Richard. There are too many wonderful Donna records to list here but there is one LP of her's that I would like to mention. It is the double LP concept album telling a modern-day Cinderella rags-to-riches story: Once Upon A Time. When it was released it just blew me away. Four sides of wonderful. It had quirky tracks such as If You Got It Flaunt It and Dance Into My Life. It had crowd pleasing pop songs like I Love You and Rumour Has It. And it had that wonderous second side featured a solid 17+ minute mix of three tracks that just transported you to another place. Way ahead of it's time were the Now I Need You / Working the Midnight Shift / Queen for a Day suite. It was 1978 and I was coming OUT! Donna has dimmed all the lights for the last time.